Rebecca Hastings is a writer who believes in embracing grace in the messy real of life. She longs for for authentic relationships and conversations with people and God. 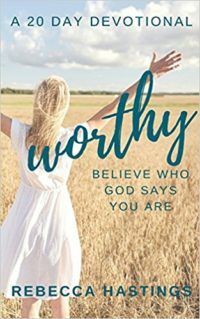 Rebecca captures hard, uncomfortable, often unspoken feelings and brings light, honesty and God’s truth to them in a relatable way. Rebecca is a wife and mother of three in Connecticut writing imperfect and finding faith along the way. She loves her people, words and chocolate, usually in that order.